To visit Villa Kokkonen could so easily turn out to be an experience of Finland at its best. Uplifting, joyful and inspiring! Then it certainly can´t be an ordinary guided tour! A 69-year-old architect Alvar Aalto designed Villa Kokkonen, a historic home which belongs to the category of his masterpieces along with Aalto House, Studio Aalto and Villa Mairea. You may attend our guided tours open to the public or make a reservation/appointment by phone or email. Villa Kokkonen is every day open by reservation (12 € / person). In order to make a group appointment or your individual appointment in advance, please send your email to info@villakokkonen.fi, or call +358414326166. It is also possible to use ►a contact form. In June, July and August we also arrange regular guided tours which are open to the public (12 € / person). They don´t require any reservation. Welcome to the Top of Finnish Architecture and Music! Alvar Aalto originally designed Villa Kokkonen´s beautiful atelier for music. However, a swimming pool, pergola, log sauna and, especially, a perfect view to Lake Tuusula will be among the first details of Alvar Aalto´s architecture to be explored during a unique artistic tour hosted and guided by pianist Elina Viitaila and opera singer Antti A. Pesonen. Finlandia Hymn composed by Jean Sibelius will be the climax of this 45-minute Finnish experience. 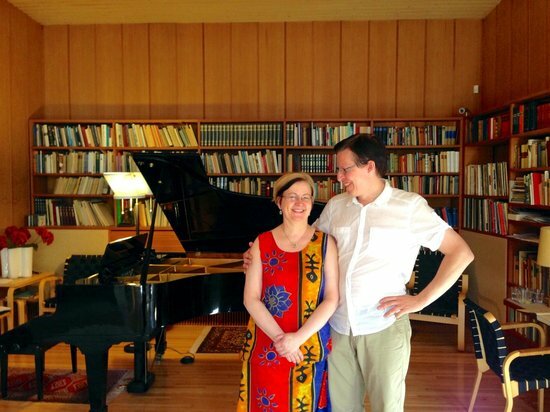 Mrs. Elina Viitaila and Mr. Antti A. Pesonen are the charming hosts of Villa Kokkonen. So much dedicated to take care of the house and its visitors since 2009. Instead of giving a straight-faced lecture the hosts of Villa Kokkonen arrange an artistic tour introducing their guests to the Top of Finnish Architecture, Music, Design and Nature. It requires only a bit of walking in the forest garden, then continues by listening to somewhat gorgeous music in the atelier which is framed by Alvar Aalto´s timelessly beautiful design and architecture. After the tour and music it might be just the right moment to enjoy Villa Kokkonen´s hot pot buffet and coffee/tea with homemade moisty cakes. Villa Kokkonen´s own kitchen gives you an awesome taste of Finnish homemade food and cakes. For ecxample, delicious Finnish Hot Pot buffet including Elina´s homemade moisty cake, dark roasted coffee and tea. Finnish Hot Pot buffet including Elina´s homemade moisty cake, dark roasted coffee and tea 24 € / person.